Ocmulgee River Blue Trail, base camping in Hawkinsville,GA. 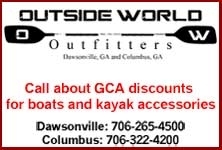 We will be starting each shuttle at Mile Branch Park in Hawkinsville, at 9:00 a.m Fri, Sat and Sunday, so if you want to shuttle, please be there with all your gear by 8:30 a.m. We will be covering approximately 30 miles of the new 54 mile Blueway on the Ocmulgee River. You won’t want to miss the presentation at the “Mile Branch Park” base camp in Hawkinsville, 7;00 p,m.. Saturday evening “Fireside Chat“ about GA’s rivers and blueway project on the Ocmulgee, Oconee, Altamaha river basin, GA’s largest river, by representatives from the National Parks, GA River Network, GA Rivers Alive, GA Riverkeepers, GA Conservancy, Ga Canoeing Association, along with historians, story tellers, and local experts. This will be an informative, interesting presentation and it’s amazing to have representatives from some of the most important river loving organizations, presenting to us! If you LOVE GA rivers, plan to attend! Mile Branch Park, County Camp road off S. Jackson Street, 1 mile on the left from Commerce Street. Also – S. Jackson Street is real close to McDonalds Restaurant so they can look for the golden arches. You are responsible to bring or acquire all gear, camping equipment, boats, pfds, and personal food. $20 donation to Ocmulgee Rivers Alive appreciated! Mile Branch Landing Panelists and Agenda on Saturday, October 8th at 7:00 p.m.
RSVP limit: 100 “Yes” campers & we’ve invited paddlers from other groups. PLEASE Reserve space NOW! 404-202-9546 and leave a message with questions.